This posting is a continuation of my basics series, this one deals with Understanding Grooming and Aggregation, two very important concepts which can have great impact on your environment if they are not functioning properly. First you need to understand the different between these two concepts, at their most basic, Grooming is the method where data older then a specific period, called the retention period, is deleted. Aggregation is the method where raw data, which is collected on short intervals i.e. 5 minutes, are averaged into hourly and daily time intervals used for reporting purposes. 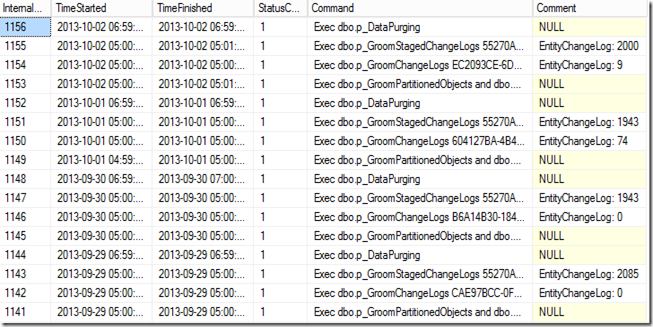 A stored procedure, called p_PartitioningandGrooming is run by a SCOM rule on a once a day schedule. 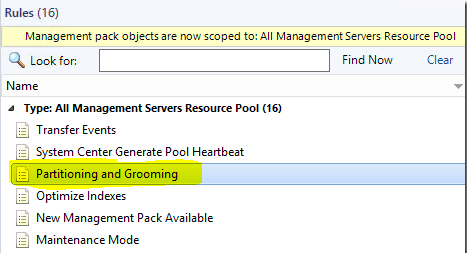 The retention settings for each data type can be set in the console under Administration > Settings > Database Grooming. A Status of 1 indicates a successful completion. The Data Warehouse is more complex, you cannot change data retention settings from the console, they exist in a table called StandardDatasetAggregation, which contains the grooming and aggregation retention periods, intervals and other related data. Data in the DW database moves through several tables as part of the aggregations process as the data is collected it is written to a Raw Data table, from there is will move to a Staging table where it will be aggregated and then moved to a relevant aggregated data table (Hourly / Daily) where it will be available to the reporting services. Then once the data in these tables is older then the data retention period it will be groomed out of the database. So why is it important for aggregation to work? And there you have it. the basics behind aggregation and grooming, I hope this has been informative. This entry was posted in SCOM 2012, SCOM 2012 R2, SCOM 2016, SCOM Basics, Uncategorized and tagged #2012, #2012 R2, #2016, #Basics, #SCOM on April 15, 2016 by Warren Kahn. This posting will be part of my SCOM basics series and covers the key concepts of Objects and Classes. A class represents a kind of object, and every object in Operations Manager is considered an instance of a particular class. All instances of a class share a common set of properties. Each object has its own values for these properties which are determined when the object is discovered. A target in the Operations console represents all instances of a particular class. For example, a viewlists all of the objects that are instances of the class that is used as the target class for the view, and a monitor is applied to all objects that are instances of the monitor’s target class. 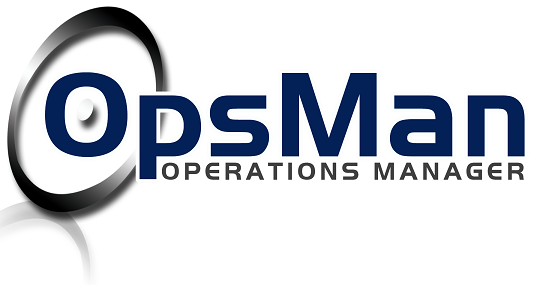 Every class in Operations Manager has a base class. A class has all the properties of its base class and could add more. All of the classes from the different management packs installed in your management group can be arranged in a tree with each class positioned under its base class. When you select a class as a target that is a base class for other classes, the monitor or rule applies to all instances of each of those classes. For example, if you use Windows Operating System as the target for a monitor, then the monitor applies to all instances of Windows Client Operating System and Windows Server Operating System. This is because those two classes use Windows Operating System as their base class. Most classes are hosted by another class. When one class hosts another, the hosting class is called the parent, and the class being hosted is called the child. Instances of the child class cannot exist without a parent. For example, several classes are hosted by Windows Computer because they are components on a computer. It would not make sense to have a logical disk if there was no computer for the disk to be installed on. 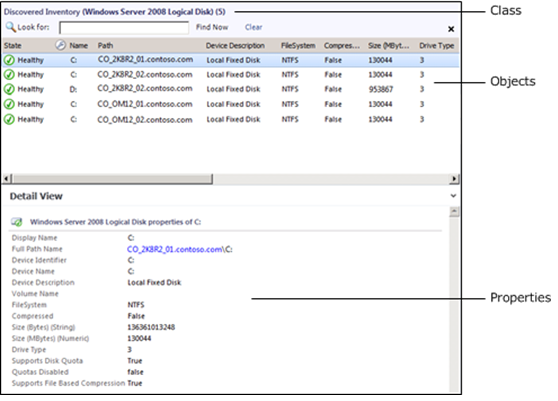 Therefore, Logical Disk is hosted by Windows Computer. This means that every instance of Logical Disk must have one instance of Windows Computer as its parent. I’ve included groups in this posting because it can be a common mistake to try and use a group as a target for a rule / monitor this can cause that rule / monitor to not function correctly as the class for a group only exists on a management server, the group will not be enumerated into it’s members from the target selection. This entry was posted in Best Practise, SCOM 2007, SCOM 2012, SCOM 2012 R2, SCOM 2016, SCOM Basics and tagged #2012, #2012 R2, #2016, #Basics, #BestPractise, #SCOM on March 29, 2016 by Warren Kahn. I’ve decided to write a series of articles covering some of the tasks that could be helpful to the newer Operations Manager administrators. 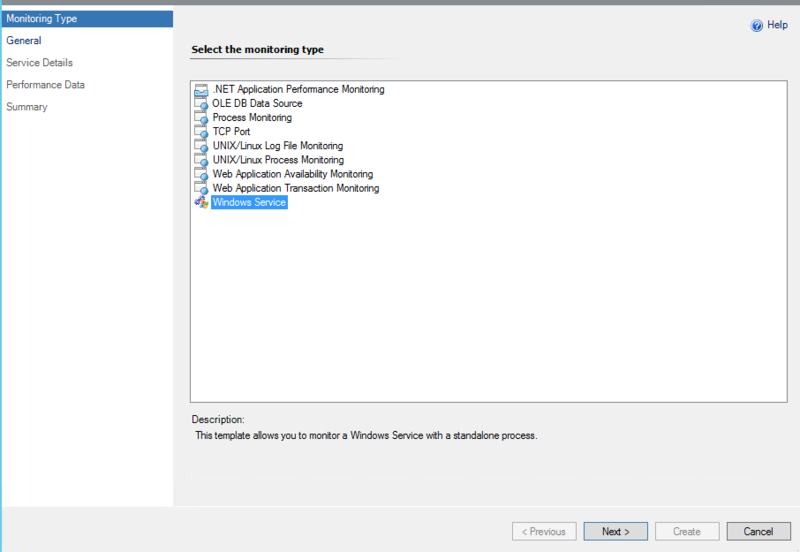 This article will cover how to create a custom service monitor and how to implement an automatic service restart action associated with that service. 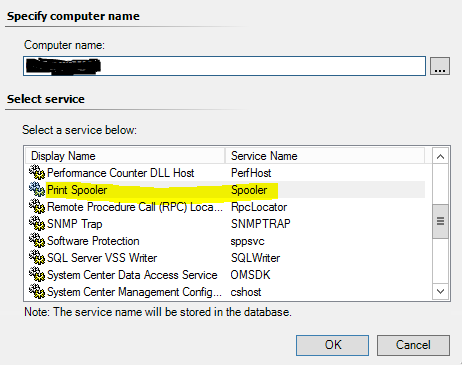 In this example we will use the Print Spooler service. 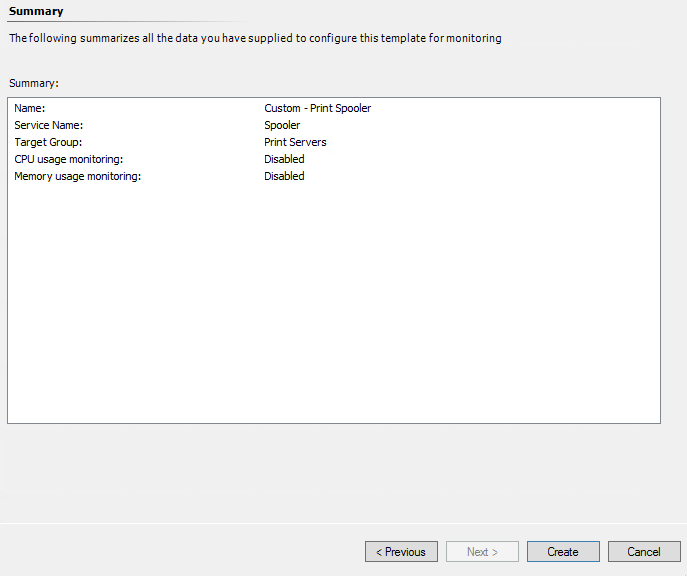 First go to the authoring node of your console, you will see a section called Management Pack Templates, this is where we will create our custom service monitor. 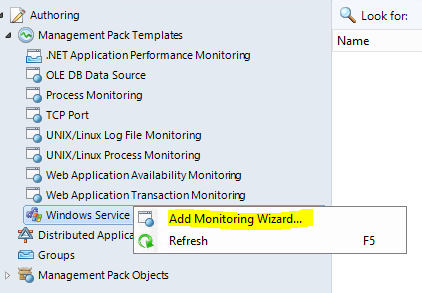 Right click on Windows Service and select Add Monitoring Wizard. 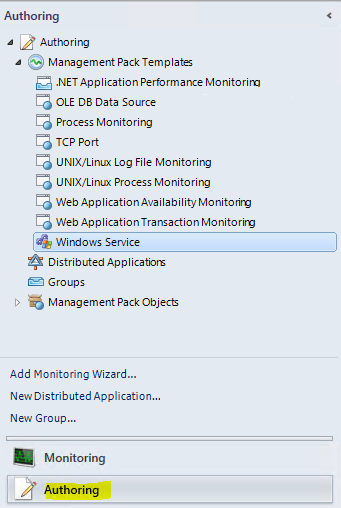 On the first page of the wizard select windows service and click next. Give your monitor a name and select the management pack that will be used to save it, you can also create a new management pack if required without leaving the wizard by clicking the New button to the right of the drop-down. Click next. On this screen we need to provide the name of the service to be monitored. Targeting a group will also limit the service discovery to only the grouped service, this prevents unnecessary load on servers that do not have the service. Tick Monitor only automatic services only if the service has automatic start. Clicking the “…” button will open the below window allowing you to search for the required service. You can connect to any server using the “…” button next to Computer name. Select the service and press OK.
Once the service details are populated click next. 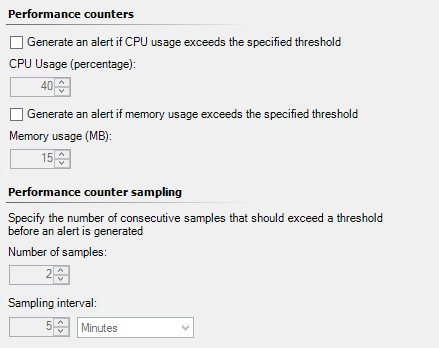 If you need to monitor performance of the service such as memory or CPU utilisation you can configure that here. If it’s not required just click next. 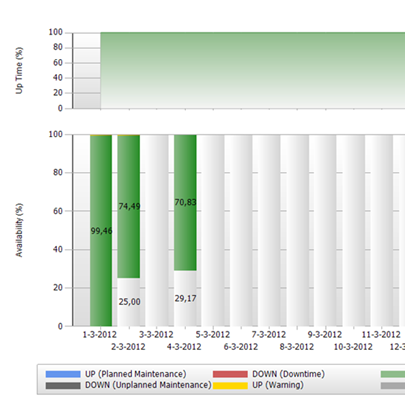 The wizard will now display a final summary for your service monitor. Check everything is correct and click create. 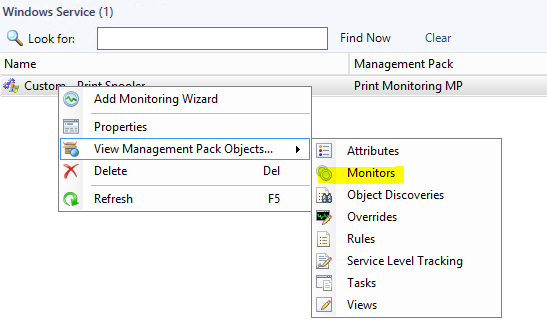 Once your monitor has been created, right click on the service, select View Management Pack Objects and then Monitors. On the monitors page expend the nodes until you find Service Running State, right click on the one that is listed in the same management pack from earlier and choose properties. 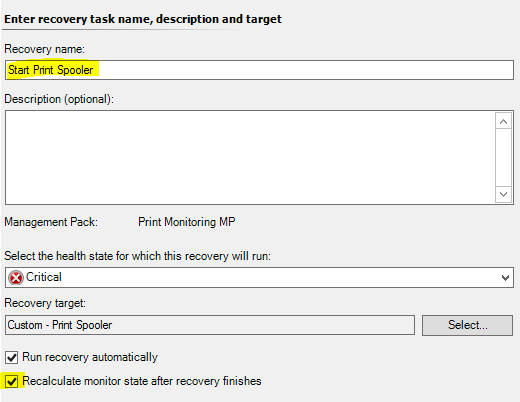 In the monitor properties click on the Diagnotic and Recovery tab, click Add under Configure recovery tasks and then select Recovery for critical health state. Choose Run Command. Click next. 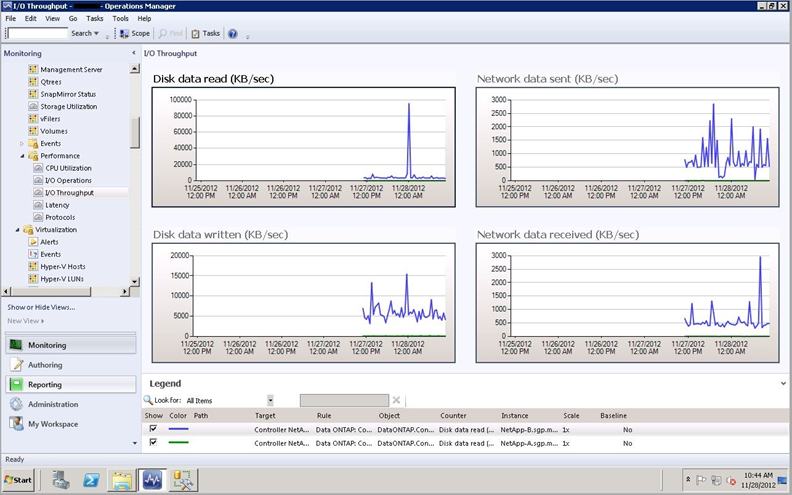 Give the recovery action a name and tick Recalculate monitor state after recovery finishes. Click Next. 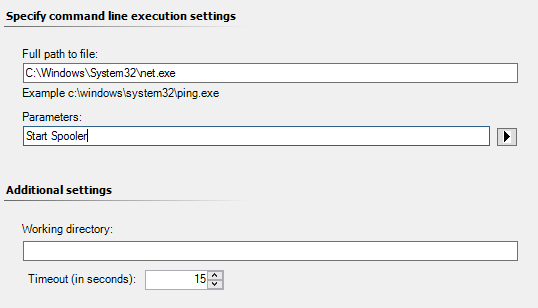 In order to start the service we will use the Net Start command, in full path to file enter the complete path c:\windows\System32\net.exe, next fill in the parameters field, begin with Start followed by the name of your service, in this case Start Spooler. Click create and close the monitor properties. And there you have it, a custom service monitor with an automatic recovery action. 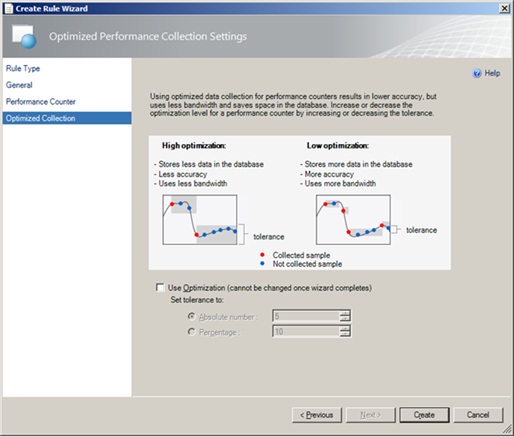 This entry was posted in SCOM Basics and tagged #Basics, #SCOM on February 9, 2015 by Warren Kahn.